Posted on November 2, 2017 , in Hot Tubs. Using water for therapeutic purposes goes back as far as the ancient Romans, Greeks and Egyptians. These therapeutic traditions continue today by playing a role in traditional medical practices such as occupational therapy and physiotherapy as well as alternative medical approaches such naturopathy. The core principle of hydrotherapy is to use water’s physical properties such as temperature, pressure, resistance and more to provide treatments for disease, pain and other ailments. A hot tub is a great way to achieve this. Utilizing the natural properties of water to promote wellbeing is the basic tenet of hydrotherapy. There are a wide variety of approaches to hydrotherapy, but they all utilize water as a means to benefit the body and its processes. For example, hot and cold water can be used separately or in succession to promote blood circulation, metabolic flow and thermoregulation. Hydrotherapy has long been used for burn treatments, the removal of damaged skin and therapeutic irrigation. Mechanical pumps and jets can be used to soothe and relax muscles while adding products such as Epsom salts or essential oils to water can be used to relieve skin conditions and other ailments. 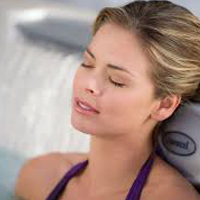 Ultimately hydrotherapy is the use of water to enhance physical wellness. Ice or very cold water is usually the first method of treatment when it comes to injury, burns and cuts. This provides a numbing sensation which reduces pain by slowing blood flow. Conversely, hot water is frequently used to relax tense, strained and sore muscles. Jet propelled water can simulate massage while the buoyant properties of water can alleviate the pressure on joints, bones and muscles that is naturally caused by gravity. It’s well known that a hot bath at the end of a busy day can alleviate symptoms caused by stress, anxiety and trauma. Warm water promotes blood circulation, stimulates the lymphatic system and encourages endorphin release which can reduce stress and tension while providing a sensation of wellbeing. Warm water and steam promote sweating which allows the body to eliminate toxins. Subsequent lymphatic system stimulation and blood circulation also contribute to expulsion of impurities. Along with additions such as Epsom salts or essential oils, hydrotherapy is great for cleansing and soothing the skin. Increased white blood cell flow and circulation promotes lymphatic system drainage and boosts the immune system by removing toxins from the body. Hot tubs are a great tool for hydrotherapy practices. The use of jet propelled, warm water massages the muscles and joints while promoting relaxation and reducing stress. The subsequent blood and lymphatic system circulation encourages endorphin release and acts as a natural pain reliever. To find out more about the many different hot tub models available and their unique hydrotherapy benefits, download a hot tub buyer’s guide.